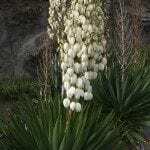 I have never had yuccas before and there seems to be a lot of brown, dead leaves. I don't know whether to clip it all back and have been told if I do this it won't bloom. Please advise me on what to do. I live in Zone 4 and do like this plant.